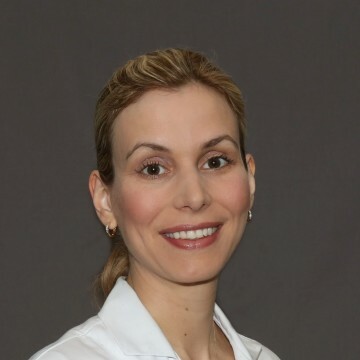 Carolin Dohle, M.D., is an attending neurologist for Burke Rehabilitation Hospital's Stroke Rehabilitation Program and is certified by the American Board of Psychiatry and Neurology. Prior to becoming an attending physician, Dr. Dohle was also a Neurorehabilitation Fellow at Burke where she developed a clinical trial to test the efficacy of a ketogenic diet—high fat, low carb—for improving post-stroke recovery. She is now leading this clinical trial and working in partnership with the Burke Medical Research Institute. Dr. Dohle also serves on Burke Rehabilitation Hospital’s Internal Review Board and the Clinical Trials Task Force of the American Society for Neurorehabilitation (ASN), where she is also a member. In addition to the ASN, Dr. Dohle is a member of the American Heart Association and the American Academy of Neurology. Dohle C., Baehring J. Multiple Strokes and Bilateral Carotid Artery Dissections: A fulminant Presentation of Ehlers Danlos Syndrome Type IV. J Neurol Sci. 2012 Jul 15;318(1-2):168-70. Dohle C.I., Bannykh S.I., Hisama F.M., Baehring J.M. Leukoencephalopathy in Adults: Is it Adrenoleukodystrophy? A Case Report and Molecular Analysis. J Neurol Sci. 2009 Oct 15;285 (1-2):235-7. Dohle C.I., Eysel U.T., Mittmann T. (2009) Spatial distribution of long term potentiation in the surround of visual cortex lesions in vitro. Exp Brain Res. 2009 Dec;199(3-4):423-33. Richerson G.B., Wang W., Hodges M.R., Dohle C.I., Díez-Sampedro A. (2005) Homing in on the specific phenotype(s) of central respiratory chemoreceptors. Exp Physiol. 90(3):259-66. Severson C.A., Wang W., Pieribone V.A., Dohle C.I., Richerson G.B. (2003) Midbrain serotonergic neurons are central pH chemoreceptors. Nat Neurosci. 6(11):1139-40. Dohle C.I., Richerson G.B. Serotonergic neurons as chemosensors in the brain. In: The Behavioural Neurobiology of Serotonin. Edited by C.P. Muller and B. Jacobs. Elsevier (2009). Dohle C.I., Reding M.J. (2012) InpatientStroke Rehabilitation Biomarkers Associated withComplicationsRequiring Transfer to an Acute Care Hospital. (64th Annual Meeting of the American Academy of Neurology, New Orleans, LA, USA). Dohle C.I., Elashvili M., Reding M. (2012) Brain Natriuretic Peptide Levels PredictStrokeOutcomes in theAcute Rehabilitation Setting. International Stroke Conference 2012 (New Orleans, LA, USA). Dohle C.I., Rykman A., Zipse J., Volpe B.T. (2011). Robotic Upper Limb Therapy as Treatment for Shoulder Subluxation in Stroke Patients.2011 ACRM-ASNR meeting (Atlanta, GA, USA). Dohle C.I., Baehring J.M. (2009). Bilateral carotid dissections and multiple infarcts: An unusual presentation of Ehlers-Danlos Syndrome Type IV in an adult patient. 61st Annual Meeting of the American Academy of Neurology.61st Annual Meeting of the American Academy of Neurology (Seattle, WA, USA). Dohle C.I.,Bannykh S., Hisama F.M., Baehring J.M. (2008). Molecular Characterization of Adult Onset Cerebral X- Linked Adrenoleukodystrophy. 60th Annual Meeting of the American Academy of Neurology (Chicago, IL, USA). Dohle C.I., Wylie C.J, Deneris E.S., Richerson G.B. (2006). Relationship between dendrites of serotonin neurons and large midline vessels of the medulla. Experimental Biology (San Francisco, CA, USA). Dohle C.I., Richerson G.B. (2005). Lack of smooth muscle in arteries next to serotonergic neurons: reduction of the diffusion barrier for CO2 in areas of central chemoreceptors. XXXV International Congress of Physiological Sciences (San Diego, CA, USA). Dohle C.I., Eysel U.T. &Mittmann T. (2002). Spatial distribution of long term potentiation measured with a 64 electrode multiarray system in rat visual cortex in vitro. Forum of the European Neuroscience Societies (Paris, France).